St Davids is surrounded by some of the finest coastline in Europe and is both the only city to lie within a national park and the smallest city in the UK. Only in 1994 was it granted its city status by the Queen, but since the 12th century it has been dominated by the cathedral, quickly becoming one of the great historic shrines of Christendom. The shrine of the patron saint of Wales lies in the purple-stoned cathedral that sits inconspicuously in a grassy hollow beneath the rooftops of the surrounding houses. Adjacent to the cathedral stands the magnificent ruined medieval Bishop's Palace and just slightly further afield are the remains of St Non’s Chapel and Cross and Holy Well: one of the oldest religious sites in Wales and possibly built within a pagan stone circle. 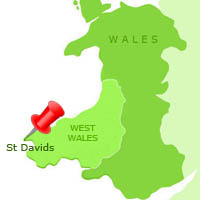 St Non’s Chapel is believed to be the birth place of St David, the patron saint of Wales. The many city attractions include the 13th century Tower Gate, the Celtic Old Cross and a number of galleries showing the work of the now thriving artistic community. It has several hotels and a youth hostel, a number of charming pubs and small independent shops. 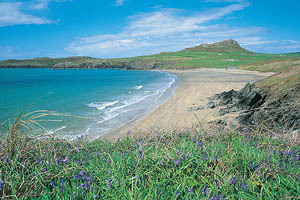 Nearby Whitesands Bay is a surfing mecca awarded the prestigious European Blue Flag Award. At St Justinian’s is the St David's lifeboat that since 1869 has saved the lives of countless seaman, although a number of heroic crewman have also perished. Other activities include pony trekking, sea trips in a variety of vessels taking in both the coast and the many nearby islands including Ramsey - owned by the RSPB as a sanctuary. See our Island Birds page for more information. There is whale, porpoise and dolphin watching along with coasteering, sea kayaking, surfing, climbing, sheep dog exhibitions and archaeological and historical guided tours. An annual drama festival is held in August, and an International Music Festival in May and June supplemented by organ recitals and concerts throughout the year in the cathedral. In September there is the Really Wild Festival of food and countryside crafts. 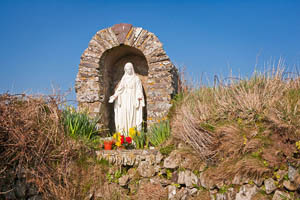 Walk the Coastal Path and Visit St Non’s Chapel and well. See more things to do in Mid Pembrokeshire. 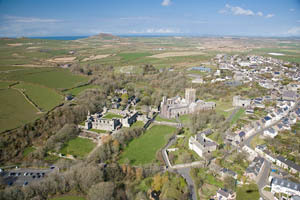 Looking for somewhere to stay near St Davids? 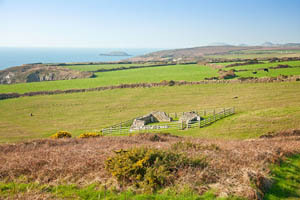 See holiday cottages in St Davids and on the St Davids Peninsula.